Last year, during a trip to Devon, I tasted the best soup I’ve ever tasted in my life. 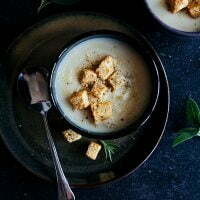 A sweet roasted parsnip and celeriac soup. Trying to order something vegan-friendly in Devon was a total nightmare and I mainly lived on chips… so perhaps the luxury of eating “real” food for a change played a part? Either way, the flavours were incredible and I have been meaning to try and recreate it ever since. So here it is! You may have noticed a lot more “moody” photos on the blog lately as it’s something I’m experimenting with. Usually I’m all about white backdrops and minimalist styling but I’m trying to mix it up a bit and step outside my styling comfort zone. So I was delighted when one of my favourite shops, Minor Goods, sent me some of their gorgeous bowls and plates to use for styling. If you haven’t heard of them already, I urge you to check out their collection of beautiful homewares! The bowls and plate featured in this shoot are from their stoneware collection, which is to die for. And as a bonus, they’re totally affordable. 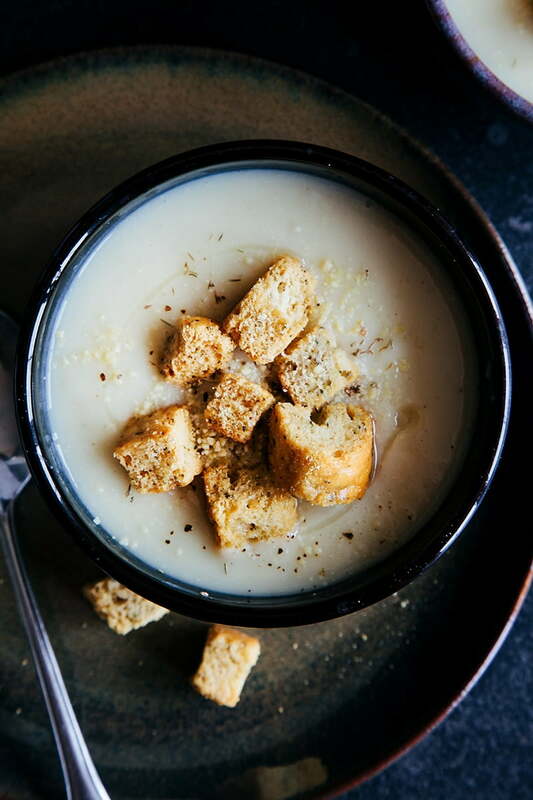 Parsnip and celeriac might seem a bit bland for a soup I have claimed to be one of the best but they actually have quite unusual flavours and when roasted with that maple syrup… Oh my. Toppings are totally optional but I strongly recommend some garlic olive oil and some of this vegan “parmesan” (or this nut-free version). It just seems to bring it all together and turns it into something extra special. Croutons are always a good thing too. 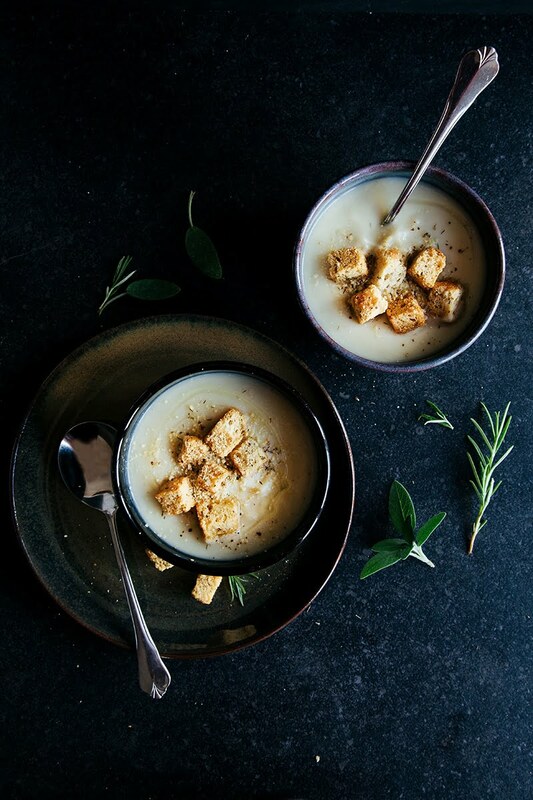 A flavourful, comforting soup for Autumn. Preheat oven to 200C / 390F and toss the celeriac and parsnips together with 1 tbsp olive oil and the maple syrup in a large roasting tray. Roast for 35-40 minutes until golden brown. Meanwhile, add 1 tbsp olive oil to a large pot and saute the onion and garlic until softened. Once the vegetables are roasted, add them to the pot with the herbs and stock. Simmer for 10-15 minutes. Remove the herb sprigs and blend until smooth. (Optional) serve with a drizzle of garlic olive oil, some croutons and some vegan "parmesan"! Parsnips are one of my favourite vegetables! Especially when paired with maple syrup. Also, I recently discovered it makes better "rice" than cauliflower. Can't wait to see what you make with yours! 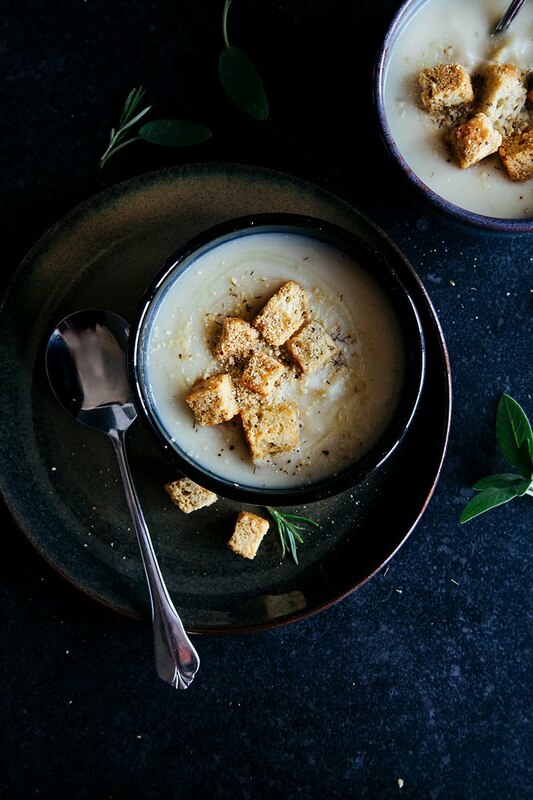 This soup looks lovely for a chilly fall evening! 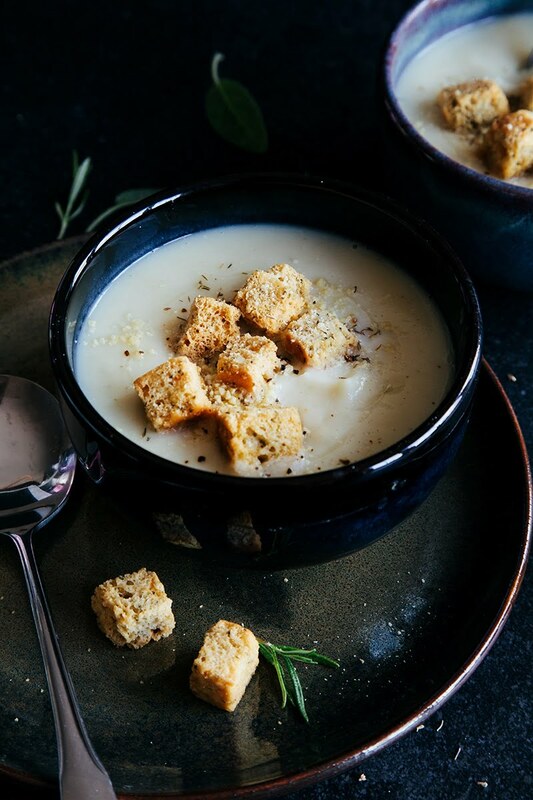 Soups are one of the best parts about this time of year. Thanks Becky!